Photo: A round spruce root basket with diamond wrapped ears made by Anthony White of Bay St. George. Constructed c1960. I got a call today, from a woman in St. George's looking for information on where she could find a copy of a video called "Making Spruce Root Baskets." The video was made in 1981 by the Memorial University of Newfoundland "Traces" project. This video focuses on Mik'maw spruce root basket making, in particular basket maker Anthony White. The video shows White collecting spruce roots, peeling and splitting the roots, collecting wild raisin and finally weaving the basket. That video is on Memorial University's Digital Archive Initiative, here. Another video we came across while doing research on Mik'maw basket making is this one, featuring Cape Breton elder Rita Smith, which we posted with permission of her family. 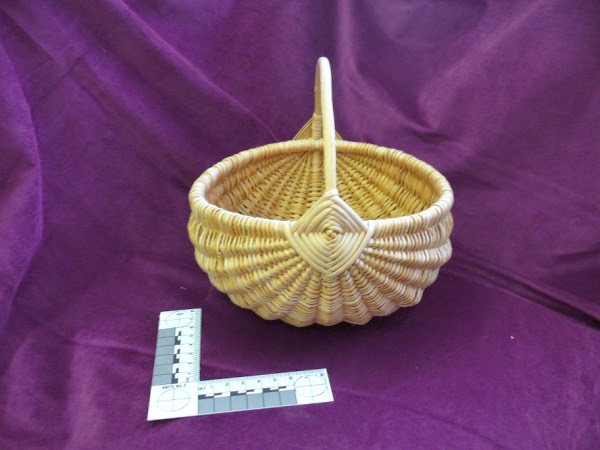 It shows the process of ash basket making, which was a type of basket made in the Maritime provinces, and then traded by Mik'maw basket sellers, who travelled from community to community by train in Newfoundland.